The IWC is the intergovernmental forum for the conservation of whales. It first recognised the economic and educational importance of whale watching in 1975, and the need to ensure whale watching is conducted responsibly. This handbook was first proposed during an IWC-hosted meeting in Patagonia in 2010. In 2017 funding was made available for its realisation, through generous voluntary contributions, and drafting and sourcing of original content for the handbook took place over the following year. Translation of the original English content into French and Spanish has been funded and coordinated by the Convention on Migratory Species. Content can be updated and/or expanded at any time, however. Anyone using this site may contact the IWC Secretariat (secretariat@iwc.int) to suggest updates, corrections, or share additional resources that could be posted on the site to the benefit of other users. 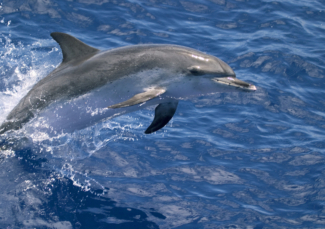 Spotted dolphin, in US coastal waters. Photo courtesy of Chris Johnson. The Handbook has been designed as an online resource, with different categories of content accessed through tabs on the ‘portal page’ that is created for different types of users: policy-makers and regulators, industry professionals, and the general public. Original content drafted for the three main target audiences of the handbook: These will be accessed through the main tabs on the ‘portal page’ that is created for each target group (Responsible Management, Preparing for a Trip, Industry Support). These texts draw from published papers, workshop/conference reports, books and manuals, and include numbered in-text citations. However, an effort has been made to keep the text accessible for non-scientists. Case studies (20): These are generally 3-5 pages long including illustrations and references, and are intended to illustrate different aspects of the management of whale watching. They represent a range of different whale watching industries, focusing on large whales or smaller dolphins, different whale watching platforms, and different levels of industry development in almost every corner of the globe. They can be accessed through an interactive map, or a searchable table that includes filters for species, countries, or management issues featured in each case study. Species accounts: detailed descriptions of the species of interest to the IWC and whale watching have been produced in two formats: 1) a longer online version with distribution maps, labelled illustrations and detailed text on the species biology, ecology and conservation status; and 2) a 1-page downloadable PDF factsheet that can be viewed on tablets or phones, or printed and laminated for use on a boat. Country Profiles: whale watching profiles for a number of featured countries include general background on the extent and scope of whale watching in that country, a table featuring key locations, times of year, and species that can be observed, a review of whale watching guidelines in that country, and (if relevant) a summary of whale watching related research conducted in that country. Downloadable content: This includes a searchable table of over 300 peer- reviewed/scientific articles on whale watching, tables with links to guidelines and regulations from almost all of the featured countries on the website, tables with links to region-specific species guides, and tables with (internal and external) links to content of specific interest to managers (workshop reports, global reports on whale watching) or industry (certification schemes, sustainable eco-tourism resources, etc). 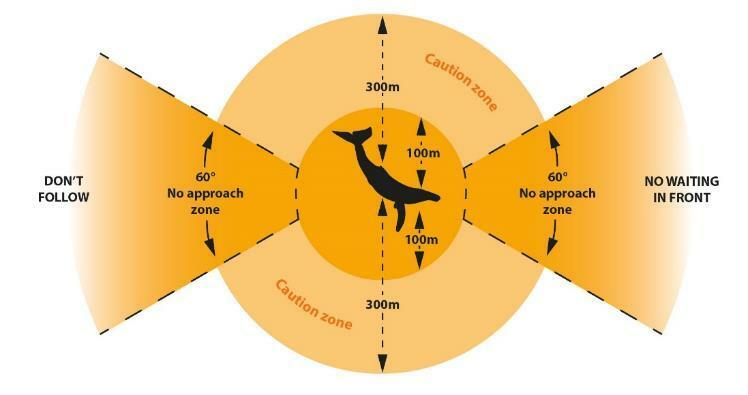 Example of an approach diagram from the Australian National Guidelines for Whale and Dolphin Watching 2017. The handbook features various local, national and regional guidelines in country profiles, case studies, and a searchable table. An example of the labelled species diagrams featured in the detailed online species accounts and PDF fact sheets. 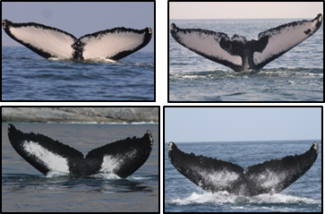 Example of photos that can be used to identify individual whales or dolphins, a way that whale watching tour operators and passengers can contribute to science and conservation efforts. Photos courtesy of the Environment Society of Oman.